Young kids love to be outside! Playing in nature is one of the best ways to encourage healthy development in preschoolers. With a little inspiration, parents and teachers can capture the child’s love of nature and promote playful learning with items commonly found in their own backyard or neighborhood. Gather some rocks, leaves, sticks, and a few simple materials for playing to learn this spring at home or in the classroom! This post is part one of our 3-part nature series: PLAYFUL LEARNING with ROCKS. 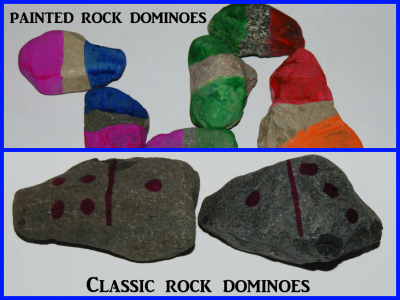 Rock dominoes are easy learning crafts to create with kids! The domino crafts below will enhance color recognition and basic counting skills as the children play. Materials needed: Rocks, Tempera Paint (assorted colors), Paintbrushes, Paper Plates or Paint Cups, and old T-Shirts (or paint smocks) to protect clothing. Rainbow dominoes are simple nature crafts for kids to create. Assemble all the supplies as an invitation to play! The children can paint both ends of a rock the same or different colors. As the children paint, allow time for discussions of colors and color choices. The painted rocks need to dry thoroughly before playing the domino color matching game below. To play a domino game: Set all of the colorful rock dominoes out on a table or the ground. One child must choose a domino to begin and then lay that domino on the ground or table. Play then passes to another player who must lay a domino with one matching colored end next to the domino already in place. The game continues until all rainbow dominoes have been used or until no dominoes can be matched to those that have been played. The game can also be played as a single player game. Materials needed: Rocks and Markers or Chalk. Invite the children to draw a line down the middle of several rocks with the markers. On each side of the midlines, have the children make dots that correspond to the numbers 1-6 (see photo above). The children can then play a domino game by matching the number of dots on one domino end to the corresponding number of dots on one end of another domino. The classic rock dominoes will help incorporate early counting and number skills into everyday play! The rainbow dominoes are not only fun to make, but are great for introducing colors and color matching activities. 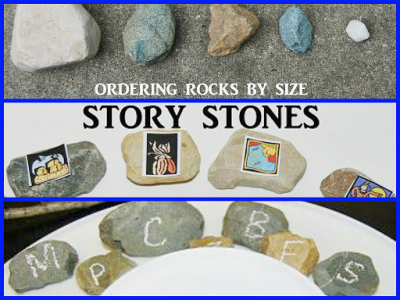 Story Stones – encourage the children to use markers to draw on the rocks. When the children are finished, have the children share what they created. Older children may wish to draw on several rocks to sequence the events of a created story. Extension: use clip art or old magazine pictures and glue to the rocks. Have the children look at the picture (or pictures) and tell a story about what the picture is about. Rock Letters and Beginning Letter Sounds – Create a rock alphabet by labeling rocks with letters of the alphabet (Note: markers or chalk work well for labeling). Younger children might match a lowercase labeled rock to an uppercase labeled rock or begin to learn the sounds associated with each letter. Older children can create beginning words with the lettered rocks. Sorting and Ordering Rocks – Invite the children to collect rocks of various sizes, shapes, and colors. See if the children can sort the rocks in groups by color, shape, size, texture, or weight. The children might also order the rocks from the smallest to largest or from lightest to heaviest. For MORE great spring learning, see the Spring and Spring Weather Theme designed just for preschoolers! You might also enjoy activities for playful learning with STICKS! Gather some sticks in your own neighborhood and play to learn with us!